Prevent loss of operations due to unplanned downtime of servers, while enabling IT to minimize and even eliminate planned downtime of servers. Get IT infrastructures back up and running much more quickly after natural disasters or other causes of unplanned downtime. Deploy solutions that ensure ongoing high availability through increased automation. Improve productivity and profitability by achieving higher levels of business continuity at lower costs. Once you have gone through the assessment of your existing applications and infrastructure, it is important to make sure that you put in place the right solutions and infrastructure that will give you the best opportunity for business continuity success. This means looking at your entire hardware foundation - starting with the microprocessor platform - and making sure the hypervisor environment delivers on all of the key features you will require for disaster recovery and business continuity. As noted earlier, virtualization has the potential to be a game changer for improving business continuity. Make sure your organization has the tools and technology in place to reach that potential. 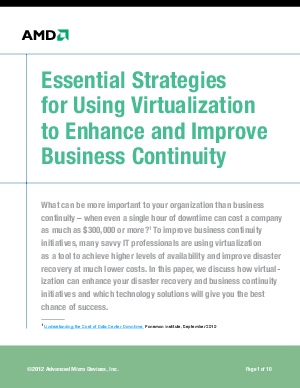 Download this whitepaper to learn more about strategies for using virtualization to enhance and improve business continuity.